Heartfelt Creations has done it again!!! this new collection is absolutely GORGEOUS!!!!! Are you ready to change the world one paper craft at a time? Spread love and encouragement wherever you go with the new Heartfelt Love Collection by Heartfelt Creations! Filled with uplifting sentiments for all occasions, you will find that this assembling of heartwarming papers, cling stamp sets and die cuts will allow you to brighten the days of friends, loved ones and those you meet along the road of life needing a little pick me up or celebrating a special day! What better way to spread smiles than through one of a kind creative projects and handmade art from the heart! 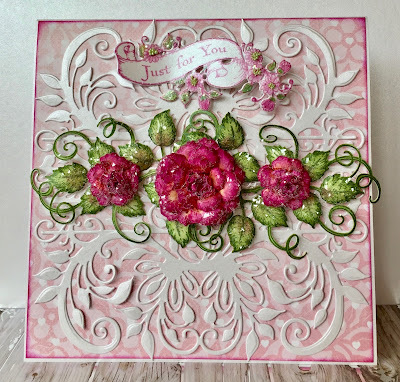 The amazing assembling of decorative papers in this love themed compilation has been created of bits and pieces featuring many previously released collections and will coordinate perfectly with many of the stamp and die combinations and decorative papers from past releases already residing in your craft room. The stunning color palette incorporates every color imaginable…from deep reds, pretty pinks, lush lilacs, to chocolate browns, sky blues and gorgeous greens, while beautiful eye catching backgrounds are filled with bold stripes, zig zag chevrons, delicate hearts, petite polka dots and dainty florals. Three lovely cling stamp sets filled with images of decorative banners, beautiful carnation like florals, and a wide assortment of love sentiments are ideal for use on cards, scrapbook layouts or altered art pieces. Two delicately patterned die cuts resembling elegant eyelet lace are ideal to bring a soft look perfect for adding a dreamy and romantic feel to any paper crafting project! Lastly, an adorable gift box die rounds out this love themed collection and creates quaint treat boxes ideal for quick packaging and makes a charming way to let those in your life know how special they are. So come alongside and join us as we share love, joy, and encouragement with everyone we meet through crafty passions one paper craft at a time! 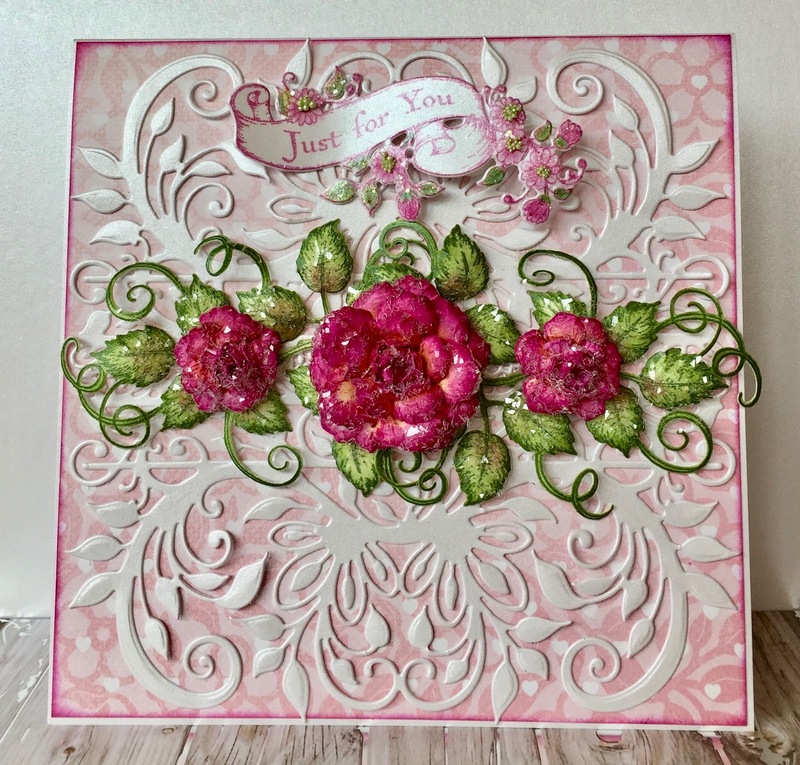 I'm in love with the Sweetheart Borders Die and I created this card with it. Instructions: Card size is 6” x 6”. Cut Pearl White Metallic cardstock 12” x 6” and score at 6” to create card base. Cut the pink designer paper from the Heartfelt Love Paper Collection 5 7/8” x 5 7/8” two times. Ink the edges with Lilac Posies Ink and adhere to the outside and inside of the card base with Dries Clear Adhesive. Cut the Sweetheart Borders Die two times from the Pearl White Metallic Cardstock. Adhere to the card base with Dries Clear Adhesive as shown. Stamp the Classic Roses on white cardstock with Lilac Posies Ink. Color with the Lilac Posies and Cantaloupe inks, Cut with the coordinating die, spray with water and shape with the Deluxe Flower Shaping Kit. 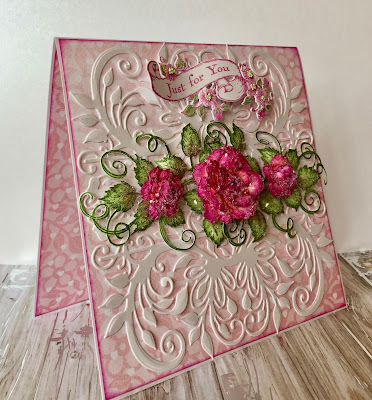 Stamp the Classic Rose Vines on white Cardstock with Bamboo Leaves Ink, color with Bamboo Leaves and Lilac Posies, cut with the coordinating die, spray with water and shape with the Deluxe Flower Shaping Kit. Add Dries Clear Adhesive to the roses and the vines using a sponge and sprinkle with Crystal Clear glitter. Stamp the Banners of Love Cling stamp on pearl white metallic cardstock with Lilac Posies ink. Use the Dove blender to color the flowers with Lilac Posies and the leaves with Bamboo Leaves ink. Using dries clear adhesive, add Lettuce Entertain You prills to the centers of the flowers. Use the sponge and dries clear adhesive to sponge the flowers and leaves and sprinkle with Crystal Clear glitter. Adhere the roses, vines and banners to the card base with hot glue gun.as shown. Thank you for stopping by...it means the world to me! Simply stunning. I keep scrolling back up to get a good look and then I go down in the body to see how you did that! Just really grabbed my attention this morning! Gorgeous. Thank you for sharing. Beautiful Janet, I love how you used the Sweetheart Border! So gorgeous! What a pretty card!! Love it!